Good News to all the Indians living in the beautiful countries of Singapore. 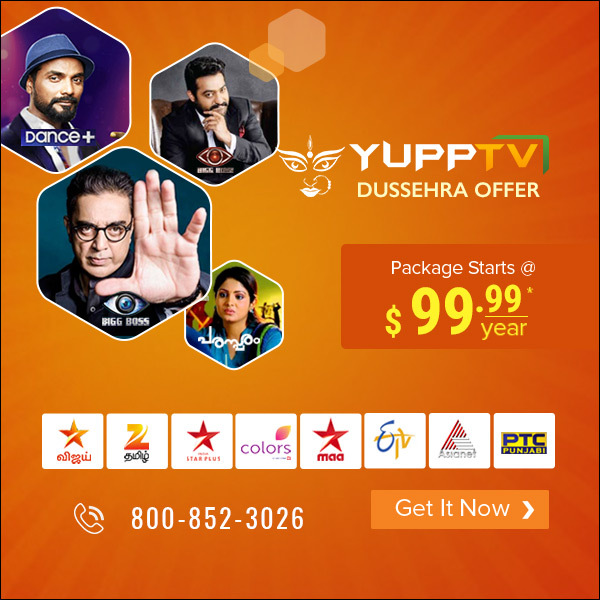 YuppTV is now delivering all the popular Star Channels like Star Plus, Star Jalsa, Star Pravah, Star Vijay, etc. along with the other popular Indian Channels like Zee TV, Zee Anmol, Zee Telugu, ETV, Zee Marathi, Colors Marathi, etc. You can enjoy watching all the popular TV shows and serials from Hindi, Marathi, Bengali, Telugu, Tamil and other languages packages starts from $99.99 per year. The best shows like Yeh Rishta Kya Kehlatha Hai, Yeh Hai Mohabbatein on Star Plus, Bigg Boss Telugu on Star Maa, Bigg Boss Tamil on Star Vijay, Premer Kahini, Adorini, on Star Jalsha, Nakushi, Sagle Karun Bhaagle on Star Pravah, are all running on all the Star Channels right now. Apart from this top television shows like Dance Plus, Bigg Boss, Kaun Banega Crorepati, Dil Hai Hindustani, Sa Re Ga Ma Pa, Dance India Dance, Jabardasth, etc., are all now available for the users in Singapore. All these TV Channels will be made available to the existing customers with the Hindi packages with no extra charge. The new customers who wish to subscribe to these channels can get them at a bare minimum price of $19.99 per month. Check out YuppTV for more details on this offer. Here is a list of some programs you can enjoy if you Subscribe Now. The show which is being hosted by the legendary actor Kamal Hassan had already become a super hit and had recorded the highest TRP among the other TV shows. This show which is broadcast on Star Vijay has come close to the ending and if you start watching now, you can catch the Epic Finale. Though the concept of the show is very new to the Telugu audience, the fact that the show is being hosted by actor Jr. NTR brought it to its glory of becoming one of the biggest Telugu reality show till date. This show has started recently and still has a long way to go providing entertainment all along. The longest running Hindi Television serial, this show has surpassed Balika Vadhu and is still running with top ratings among the audience. The show which portrays the story of a young couple who live in a joint family has garnered millions of fans across the globe. This latest show which starts on 17th September on the occasion of Durga Puja is in compliance with the tradition of Bengali Serials on Star Jalsha. The channel which always portrays the story of Goddess Durga in a beautiful and creative way is coming up with “Jagat Janani Durga” this year. The television serial portraying the life of the legendary Maratha King Chhatrapati Shivaji has been one of the top-rated serials on Star Pravah. This Marathi serial which is familiar to the audience around the world is now available for the users in Singapore to watch.